Bronchogenic carcinoma used to describe lung cancers that began in the bronchi and bronchioles, but is now used to describe many lung cancers, sometimes even used interchangeably with lung cancer. Though bronchogenic carcinoma is commonly associated with lung cancers related to smoking, you do not have to smoke to get lung cancer. Why Did the Disease Change? Over the years, the types and locations of lung cancer has changed, and the cause is believed to be because of cigarette filters and more added chemicals. This transformation of cancer has led to bronchogenic carcinoma being used as a general term for lung cancer instead of a specific type. 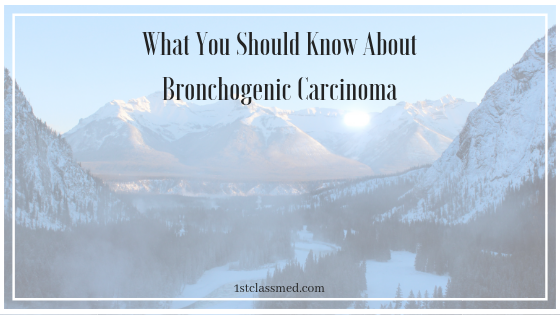 Some medical professionals may still use bronchogenic carcinoma to describe cancer that begins in the bronchi and bronchioles. Previously bronchogenic carcinoma was rare, even in the early 1900’s few cases were reported. Now, as the definition and time has changed, lung cancer is now the leading cancer-related cause of death for both men and women (in the U.S.). 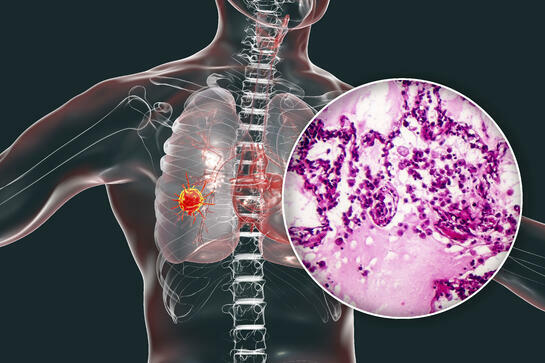 Common types of lung cancer used to be squamous cell lung cancer, and small cell lung cancer, but currently the most common type is adenocarcinoma. This is thought to be because of cigarette filters, as they require you to use more force when breathing in the smoke. Though lung cancer is common among smokers, you do not need to smoke to get lung cancer. Symptoms of lung cancer can be different for everyone, some may have many symptoms while others may not have any symptoms at all. Adenocarcinoma is currently the most common type of lung cancer, and it comes with a different array of symptoms. The typical cause of bronchogenic carcinoma is smoking, but there are plenty of other causes of bronchogenic carcinoma. Exposure to radon, asbestos, air pollution, secondhand smoke and occupational carcinogens can all cause lung cancer as well. If you begin to have symptoms your doctor may recommend an x-ray or CT scan to see if there is anything abnormal in the lungs. You may not have any symptoms early on, and it is possible that it is caught while getting an x-ray or CT scan for anything reason. It is possible that a PET scan would be done in order to determine if the cancer is spreading to other areas of the body. This will allow medical professionals to determine the stage of cancer and the treatment plan based on the severity. If an abnormality appears on an x-ray or CT scan, the next step is often a lung biopsy to determine if the original diagnosis is correct and the genetic makeup of the cancer. Genetic testing is important because it helps medical professionals look at the genetic makeup of the cancer and figure out what treatment would be the most successful. 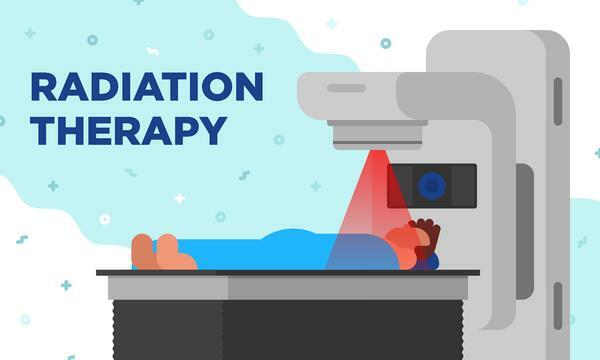 The treatment plan your doctor will put you on is often specific to your type and stage of cancer. It is important to involve yourself in the diagnosis and treatment, as those who learn about their diagnosis and are involved often have better outcomes. Common treatment options include, chemotherapy, radiation therapy, immunotherapy, targeted therapies and lung cancer surgery. Though those are not the only options for those with lung cancer, as some medications may also be used to help treat it. The prognosis for bronchogenic carcinoma remains poor, as the 5-year survival rate is right under 20 percent. This should not be disheartening, as it truly depends on the stage of cancer you have when diagnosed. It is vital to know your body and if you noticed anything off, see your doctor. You may feel silly, but it is important to be proactive versus reactive when it comes to your health, even if that means you see your doctor more often than most people. If you are diagnosed with bronchogenic carcinoma, you may feel overwhelmed and alone, but you are not. As it is the leading cause of cancer-related death, you are far from alone in your situation. Not only can you find comfort in loved ones who are there to support you no matter what, but you can also find people online and in person who are going through what you are. You can find support groups online or in person, where many people have also been diagnosed with bronchogenic carcinoma and understand your concerns and questions. Bronchogenic carcinoma used to be the name for lung-cancer that specifically started in the bronchi and bronchioles. As the term has changed, it has become the umbrella term for lung cancer. Though you may not notice any symptoms right away, the symptoms may become more noticeable as the cancer spreads. Your doctor will commonly turn to x-ray and CT scans to first diagnose the cancer and then preform a lung biopsy to confirm the diagnosis and determine the genetic makeup. Treatment will depend on your condition, and it is important to be involved in your treatment. The prognosis for bronchogenic carcinoma is low but doesn’t mean it is the same for everyone. Finding a group of people who you can connect with and share your concerns is important throughout the entire process as well. The key is to educate yourself and find a group of people you can connect with.